One of our more popular posts last year told the story of people folding thousands of paper origami cranes to raise money in the wake of the devastating earthquake and tsunami in Japan on March 11, 2011. More than 700,000 cranes were received from all over the U.S. and other parts of the world in just six weeks. In honor of those efforts, a foundation donated $400,000 toward rebuilding efforts. We’re happy to report that money is going to good use today through the organization Students Rebuild. Read all about what they are doing in Japan on the organization’s website. Students Rebuild organizers are reporting that the paper cranes for Japan are now arriving by the boxfuls to their offices in Seattle. As of this writing, they have collected more than 8,000 cranes, raising more than $16,000 for Japan relief! There’s still time to contribute to the goal of collecting 100,000 cranes for a large art installation and donations totaling $200,000. The only catch: organizers only want cranes from young people up to age 25. The other day in my local paper there was a lovely small story about a Stanford student named Robin Thomas who set up a table for his fellow students to help him fold 1,000 origami peace cranes for Japan. In Japanese legend, anyone who folds 1,000 cranes will be granted a wish by a crane for things like a long life, or recovery from illness or injury. Thomas encourages students to write prayers or well wishes on each piece of paper before folding. Being an origami fan myself, I was so struck by the idea of folding the cranes as a way of praying for, or sending good wishes to the Japanese people, I got out my stash of origami paper and struggled through instructions to make my own cranes. 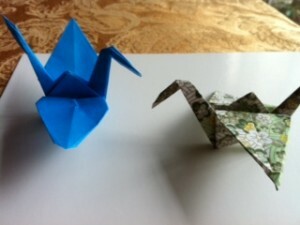 I also thought wouldn’t it be great to ask people online to fold their own cranes and then post pictures of them. We could do a virtual collection of 1,000 cranes for Japan. As I started doing research on peace cranes, lo and behold someone was already on the case of the virtual crane collection. 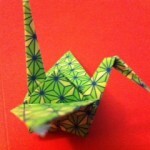 Dosomething.org started “Paper Cranes for Japan” on Facebook on March 11. Since the Causes creation started just a week ago, nearly 6,800 people have “liked” the page, and more than 1,200 photos have been posted. I had also wondered how someone could connect fundraising to the origami cranes, and it turns out someone figured that out, too. Two groups, Architecture for Humanity and Students Rebuild, noticed the Facebook page and decided to issue a challenge to young people to fold cranes and send them in, with the Bezos Family Foundation pledging $2 for Japan relief for every crane mailed. The goal is to collect 100,000 cranes that will be incorporated into a major art installation. Folding the cranes is not the easiest of origami creations, but I found if I stuck with it eventually I could do it. 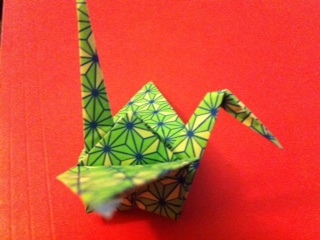 There are numerous places online to learn how to fold the cranes. Paper Cranes for Japan has links to instructions. 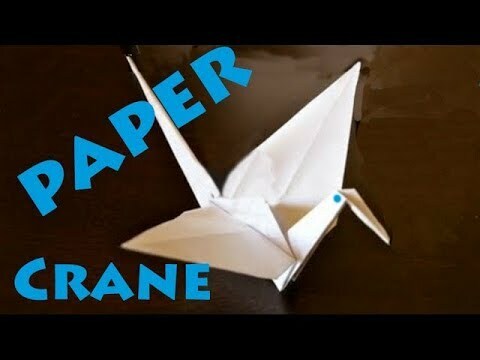 The two places I found that helped me were a UK website called Origami.org.uk, and a YouTube video, “How to Make a Paper Crane (Tsuru)”. The origami site has a 3-D image of the folding process, and you can easily stop the image, or go back over steps (and over and over, like I did). I also had to watch the YouTube video multiple times. But as you can see from the photo, my persistence and patience paid off. What a great project this would be for (older) kids. It’s a wonderful group project, and one that could be done anywhere with almost any paper. Students Rebuild will even send you a pre-paid shipping label for large boxes if you send an e-mail. UPDATE: Students Rebuild tells me that they only want paper cranes from people age 25 and YOUNGER. I asked if they would take cranes from the “young at heart”, sadly no. For us older folks, post photos of your cranes at the Paper Cranes for Japan Facebook page.